02.20.11 Tournament activity keeps the heat on at the Portland Chess Club. 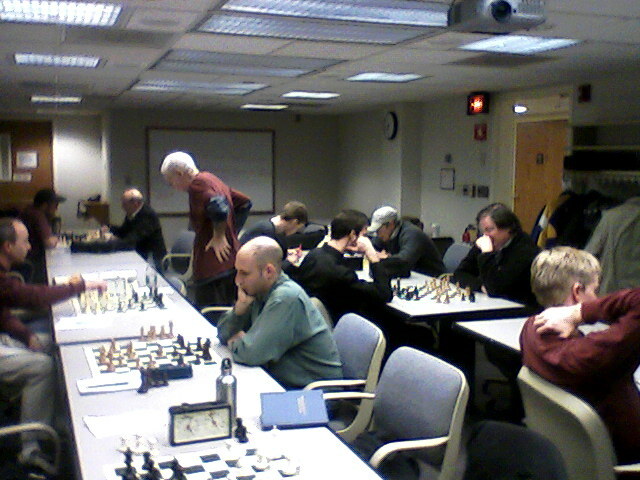 While snow piles up outside, USCF tournament games pile up at the regular Friday evening meetings of the Portland Chess Club. Having completed the PCC Fall Quads the week before Christmas, the PCC has just launched the PCC Winter Swiss. The Portland Chess Club meets each Friday in the Upper Auditorium of Mercy Hospital, located in Portland on the corner of State and Spring streets, from 6:00 p.m. - 9:30 p.m. The PCC Fall Quads began at the end of September with sixteen players in four quads, featuring two G/90 matches per round. Since all pairings were pre-set, each player was provided with email addresses for the other quad entries and given twelve weeks to complete the six games. Matches were allowed to be played at the Friday evening club, Sunday morning coffee shop, or any other mutually agreed location. The tournament also saw the return to OTB play of former MECA secretary Bob Leach, of Mount Vernon, a long time competitor in Maine chess tournaments, after nearly ten years away from tournament play. Welcome back, Bob! After resetting clocks and restacking pawns, the PCC Winter Swiss kicked off February 11 with fourteen players in a three-round, G/90 nine week event. This event is being directed by Dan Keliher as a newly minted USCF Club Director. Besides regular play at the PCC, Dan is a member of the Yarmouth HS team, and plays regularly in state-wide tournaments. Watch for results from this event sometime in April.